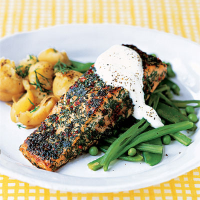 Add spice to Scottish Salmon fillets with chilli and dill. Serve with crushed new potatoes to soak up the creamy sauce. Place the chilli, sugar, salad onions and dill on a large plate and add some salt and freshly ground black pepper. Stir to mix, then press the salmon fillets into the rub until well coated on each side. Melt the garlic butter in a shallow pan over a medium heat then carefully lower in the pieces of fish. Fry for 2-3 minutes then turn with a fish slice and cook the other side for a further 2-3 minutes, or until the flesh has just turned opaque. Cooking time will depend on the thickness of the fish. Take care not to over cook. While the salmon is frying, cook the vegetables in a pan of boiling water for 4-5 minutes then drain well. When the salmon is ready, place it on a warm plate. Take the pan off the heat and wipe out with kitchen paper. Spoon in the soured cream and leave it to warm in the heat of the pan. Place the salmon on a bed of the mixed vegetables and pour the cream over. Serve with some lightly-boiled new potatoes that have been crushed slightly with a fork and sprinkled with chopped dill and cracked black peppercorns. When preparing fresh chillies, hold by the stalk while deseeding and chopping to avoid the fiery oils from the chilli touching your skin, or use disposable gloves. The salmon can be coated in the rub the day before then covered with clingfilm and kept in the fridge. Instead of fresh chilli, add a large pinch of cayenne pepper to the rub.